How do you preserve the exposed nuts on a chocolate nut paw? If you completely cover them with chocolate, they don't look like paws any more. If you don't cover them, the nuts get a stale taste if not eaten right away. I combined your two questions into one with the hopes of helping you come up with a solution to your problem. 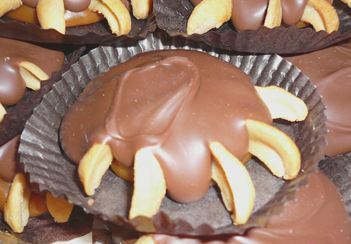 I have to admit that I hadn't really heard of chocolate covered nut paws before you asked about them. I've done a little searching and found the two photos above for Cashew Bear Claws and Chocolate Bear Paws and assume you must be referring to something like those. They do sound yummy for sure, and they are very cute. I can see them being a perfect party favor for a young boys birthday, a harvest party, or other themed events. I do understand your dilemma. One of my big "dislikes" is stale nuts of any variety. I love cashews, but they really lose their appeal when they have that old taste to them. nuts before using them in making the chocolate nut paws. Probably the easiest way to do that is to first toast your nuts in the oven for about 5-8 minutes (at about 350°). Prepare a sugar coating. There are various recipes online, but the easiest one is probably just to heat white sugar in a heavy saucepan until completely melted. General rule of thumb is about 1/2 cup of white sugar per 1 1/2 cups of nuts. Begin stirring once the sugar starts to melt and continue until completely melted. Mix the nuts into the sugar mixture and stir quickly to coat and then tip them onto a waxed paper lined tray or a well buttered tray. Working as fast as you can, use a couple of forks to separate the nuts so they aren't all clumped together. Once the candied nuts are cool, you can then use them in your recipe for the chocolate covered nut paws and the exposed nuts should stay fresher for a longer period of time because of the sugar coating. Let us know if this solves your problem. 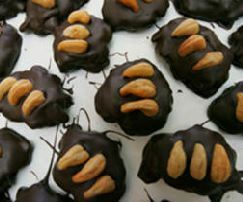 In fact, send us some photos of YOUR chocolate nut paws and include your recipe and step by step process. You can use the same form that you use to ask this question and we'll link the two together for others to see how yours turned out.